We’re hard at work making improvements to Jilt every day, from minor enhancements to major new features, so we have a lot to share in this month’s update. And by this month, I mean really the last 2 months. Hey, we’ve been busy! Here are some of the things we’ve rolled out since our last update. TL;DR: we’ve got a new look, new pricing, we’ve made it easier to track click analytics, added other nice refinements, and have lots more in the works. A couple of weeks ago we debuted our new branding site- and app-wide. We worked with Jon at Hicksdesign on this, and we’re super excited about the results. You’ll see the new look within your dashboard as well. In addition to making our online presence more “our own”, you’ll start seeing our new branding on the swag we hand out at events, starting at WordCamp US in Nashville, TN, Dec. 1-3. Will we see you there? When we originally expanded Jilt to platforms outside of Shopify, we changed the pricing to a percentage of recovered revenue. We felt that this aligned us with our customers: we were willing to work really hard to help you improve your campaigns so you earned more, which meant we earned more. Here’s the thing, though: we do that anyway — it’s part of our core values. We’re here to help your business succeed. We also have big plans to expand Jilt into other lifecycle emails and automations, so we want a pricing structure that aligns with this goal rather than charging “per feature” or revenue. You don’t pay for your “list size” or customer count. When a customer abandons a cart, you may contact that person once, then not ever email that customer again. Don’t pay for that person to be on your “list” forever — you’ll be charged in the month you email them, and not again. We had a lot of mixed feedback about our previous pricing. Understandably, you want to know what you’ll pay per month, regardless of what value the app drives. This pricing is more focused, and it makes it easier to see the maximum you’d pay with Jilt each month. Not signed up yet? Check out our pricing page to get an estimate of MCEs based on your current order volume. You can now see what your customers do when they click a recovery button. We’re automatically including UTM link parameters in the recovery link (usually a checkout button), which allows you to see what your users do on your site using Google Analytics (or most other web analytics apps). You can track which pages recipients of your recovery emails visit, and what products they view and ultimately purchase. For Shopify stores, the new UTM links mean you can view how many customers are converting from your Jilt campaigns versus other marketing efforts directly within your Shopify account’s Marketing Reports. Sending a recovery email when the items in a customer’s cart are out of stock is both unhelpful and annoying for customers. We don’t want you to irritate your shoppers or waste money sending recovery emails that can’t possibly result in a sale. 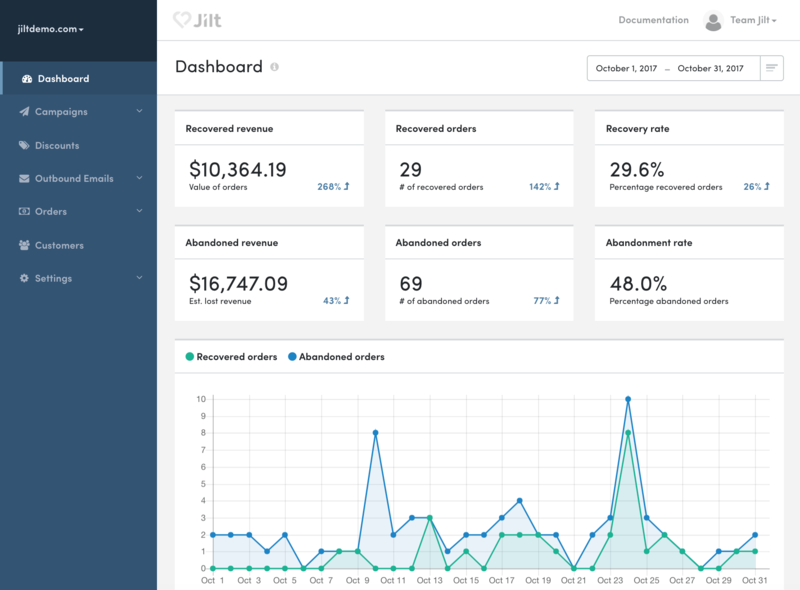 Now Jilt automatically checks your shop’s inventory prior to sending out a recovery email and will only dispatch one if at least one item in the user’s cart is in stock. 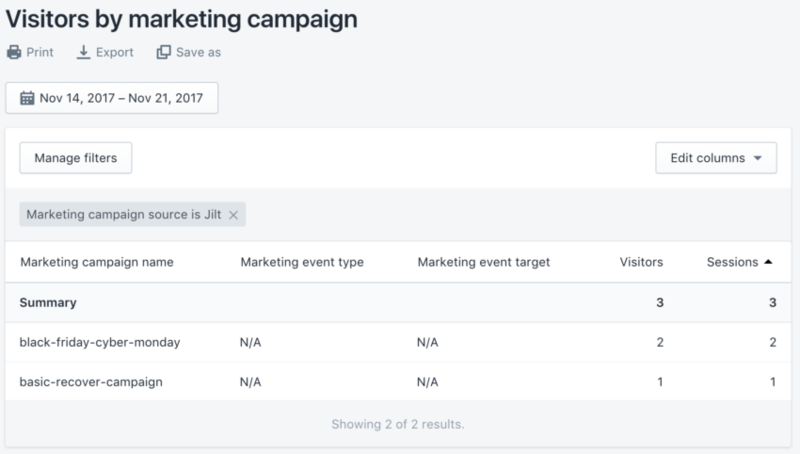 Jilt now imports items from your product catalog to use when previewing campaign emails in the editor. This is a minor change with big impact: it gives you a more realistic view of what your customers will actually see when they receive emails through Jilt, which means you can do a better job of crafting winning recovery emails. Finally, a quick bonus for Shopify stores: any discount you offer in recovery emails will be automatically applied when a user clicks a recovery link. No more “please copy and apply this coupon” — we’ll do it for them to cut out every click we can. Here’s one for the WordPress folks: a feature purely devoted to reducing abandoned carts rather than saving them (and we’re including that feature totally free). Customer registration is a proven way to increase likelihood of repeat purchases and it gives you more marketing tools, but forcing registration can lead to more abandonment. We’ve added a feature to help you reduce future abandonment by enabling post-checkout registration. This lets you offer quick registration after checkout to save customer details for future orders. 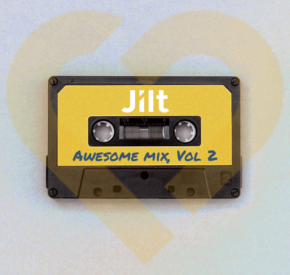 You can even continue to use this if you disconnect from Jilt. Read more about it here — this feature is in Jilt for WooCommerce 1.3.0, and will be available shortly in Jilt for EDD (coming in version 1.2.0). eCommerce happens all over the world, and Jilt now handles this better: both tax-inclusive and exclusive pricing displays are fully supported! Jilt will use your existing shop settings to determine how your prices are shown, then match this in recovery emails to ensure they’re consistent with your site, and properly labeled for your customers. Soon you’ll be able to upload images (like your logo) directly to Jilt. Want to use a different logo from the one on your website? No sweat, you’ll soon be able to upload logos and other images to your Jilt account for easy access when tailoring your campaign emails. We’ve been working on this one for a while, so we’re really excited to have a new email editor coming within the next 2 weeks! This gives you a complete drag-and-drop, WYSIWYG editor to make it even easier tweak your campaign emails. After launching the email editor, we’ll also be launching post-purchase follow ups! 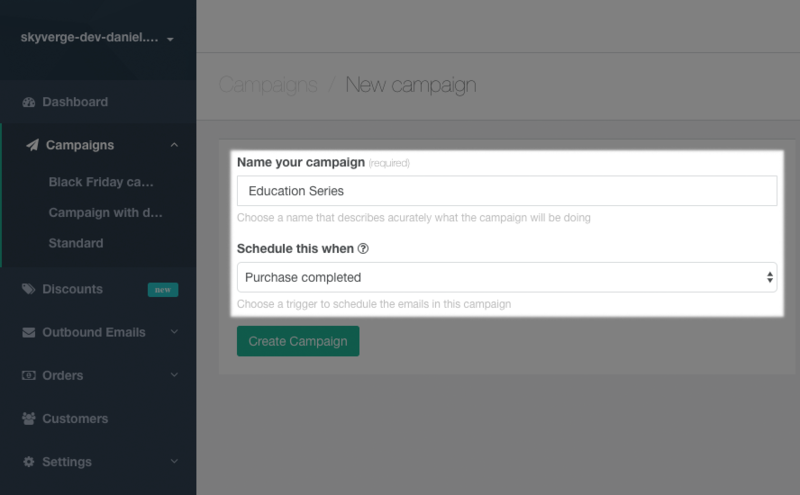 This will let you create “triggers” for your campaigns: instead of always being triggered by an abandoned cart, you can choose whether the campaign starts with an abandoned cart, or from a completed order. Remember, with our new pricing, you won’t pay more to get this feature. Instead, it gives you a different avenue to reach out to your customers to cross-sell products, ask for reviews, get feedback, and more. So if you’ve already contacted a customer to recover a cart, they’re only counted once as an MCE, even if you send post-purchase follow ups, too!